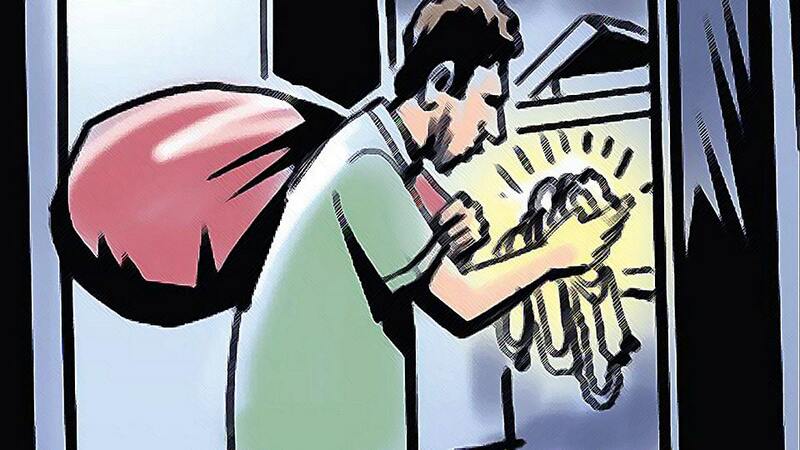 Mysuru: In separate cases, three houses have been burgled in city and burglars have decamped with gold ornaments, cash and other valuables worth lakhs of rupees from the houses. Case 1: Burglars who gained entry into a house at Kanakadasa Nagar ‘J’ Block belonging to one Hemalatha by breaking open the lock of the front door on Monday, have decamped with Rs. 10,000 cash, about 166 grams of gold jewellery kept in the almirah and 1.5 kg silver articles all worth about Rs. 3.75 lakh. Hemalatha had left the house at about 11 am on Monday after locking the house and returned at about 3 pm only to find the lock broken and the front door open. When she entered the house, she found the cash and valuables missing and lodged a complaint with Kuvempunagar Police. Case 2: Burglars who gained entry into a house of one Gajendra at Bankers Colony in Saraswathipuram Police limits on Monday, have decamped with cash and valuables worth lakhs of Rupees from the house. Gajendra, who had locked the house had gone out at about 10.30 am and returned at 1.30 pm only to find the lock broken. Upon entering the house he found Rs. 1 lakh cash and gold ornaments worth lakhs of Rupees kept in the almirah missing. Case 3: In the third case, Puneeth Kumar Jain, a resident of Vinaya Marga in Siddarthanagar has lodged a complaint at Nazarbad Police Station regarding gold jewellery being stolen from his house. In his complaint he has stated that a maid from Alanahalli here, who used to work at his house, had come from Feb. 12 to 18 and had stopped coming after that. He has further stated that a few days ago when he inspected the almirah in the house, he found gold jewellery weighing about 220 grams kept in the box missing and has suspected the hand of the maid behind it. Nazarbad Police, who have registered a case in this regard, are investigating. CAT stays Rohini’s transfer till Mar. 21 So what does Randeep do?